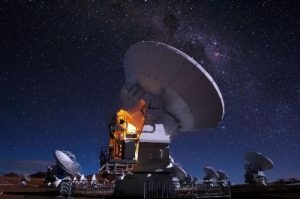 The goal of the observations was to image, for the very first time, the shadow of the event horizon of the supermassive black hole at the centre of the Milky Way, as well as to study the properties of the accretion and outflow around the Galactic Centre. The Atacama Large Millimeter/Submillimeter Array the world’s most sensitive facility for millimeter/submillimeter astronomical observations, and plays a key role in the EHT network. More details in the ESO dedicated page. 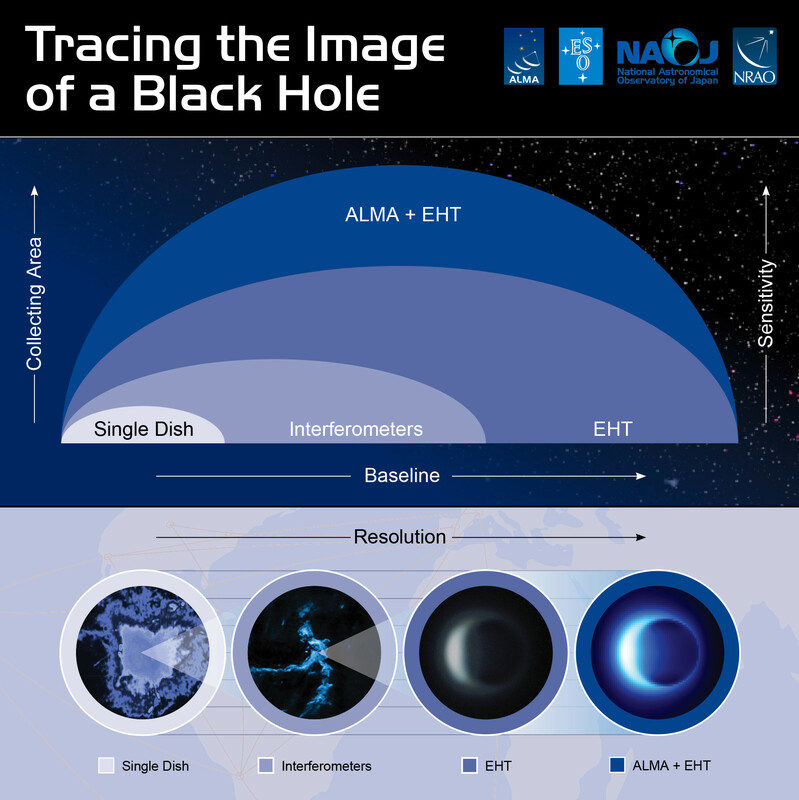 This infographic illustrates how ALMA contributes to the EHT observations. 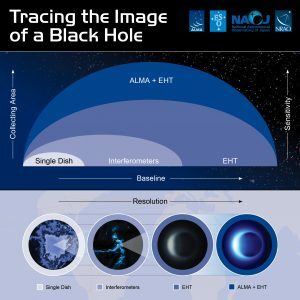 With its shorter baseline, ALMA is sensitive to larger scales than the EHT and so ALMA can fill in the lower-resolution, larger-scale structures that the EHT misses. The ALMA Director, on behalf of the Joint ALMA Observatory (JAO) and the partner organizations in East Asia, Europe, and North America, is pleased to announce the ALMA Cycle 7 Call for Proposals (CfP) for scientific observations to be scheduled from October 2019 to September 2020. 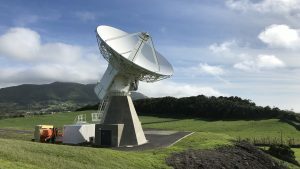 It is anticipated that 4300 hours of the 12-m Array time and 3750 hours of the Atacama Compact Array (ACA) time, also known as the Morita Array, will be available for successful proposals from Principal Investigators (PIs) in Cycle 7. For further details visit the ALMA Science Portal. The fifth call (2019) for 5 PhD Fellowships of the PhD::SPACE Program, funded by the FCT PD Program initiative is now open for applications to be submitted by the 31st of March 2019. PACE has been invited by the ‘Regiao Autonoma de Azores’ and the RAEGE consortium to visit the Colombo station in the Azores Island of Santa Maria. Equipped with 3 receivers in bands S (2.2 – 2.37 GHz), X (8.15 -9GHz), and Ka (21.77 – 24.45 GHz), this 13.2 m radio telescope is part of the International VLBI Service for Geodesy and Astrometry (IVS) network (RAEGSMAR). During this visit, resident RAEGE scientists described to PACE researchers the capability and the performance of the telescope, in order to explore the possibility of future synergies with such a valuable instrument. A Picture taken by the PACE representative, José Afonso, during the visit. 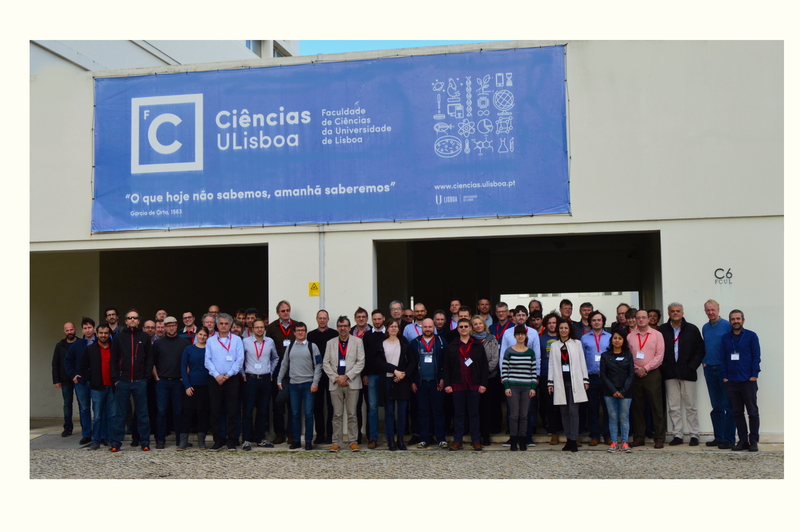 PACE members participated in the international Athena-WFI meeting (see link for the detailed programme), held on the end of November at the Faculty of Sciences of the University of Lisbon. The Wide Field Imager (WFI) is an instrument that will be mounted on the Athena Space Observatory, an X-ray telescope designed to address fundamental questions in Astrophysics involving high energies. The launch is scheduled for 2031, and PACE explored during the meeting potential synergies between Athena and millimetre and submillimetre Astronomy. 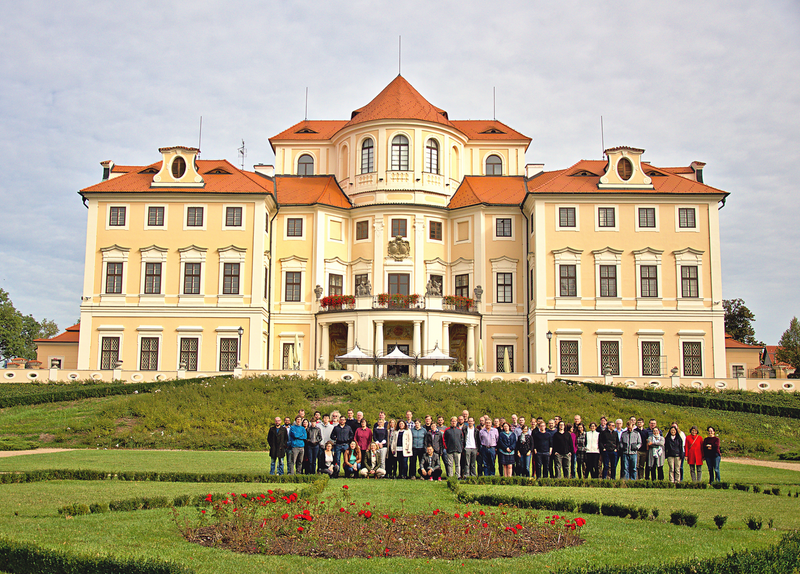 On the last week of September, PACE participated to the annual meeting of the European ALMA Network, hosted this year by the Czech ARC Node. 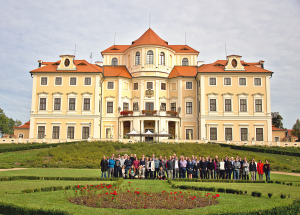 In the beautiful landscape of Prague countryside, representatives of different European Institutions discussed the status and future plans for ALMA development. With new facilities starting soon their operations, these meetings aim to assure for ALMA a future at the forefront of astronomical research for the next decades. Group Photo at the Chateau Liblice. 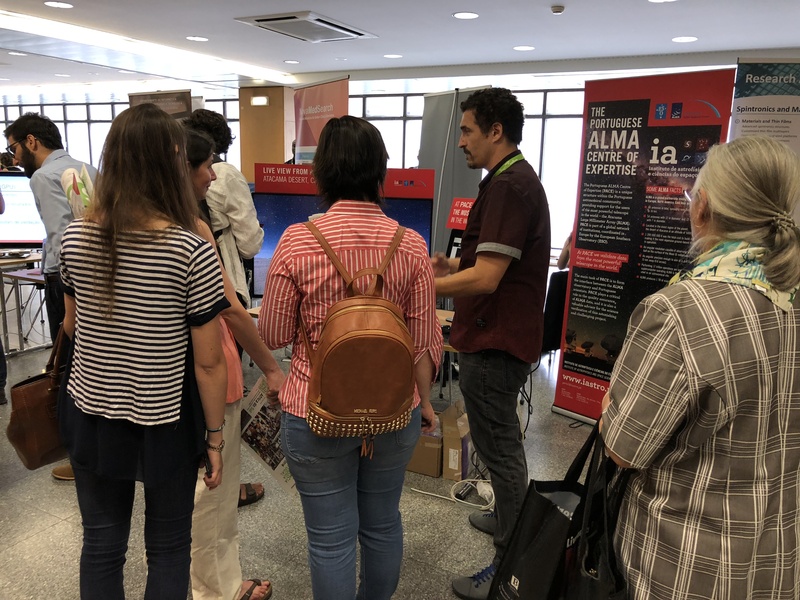 On 2-4th of July, PACE participated to the ‘ Encontro Ciencia 2018 ‘, the annual meeting of Portuguese researchers. 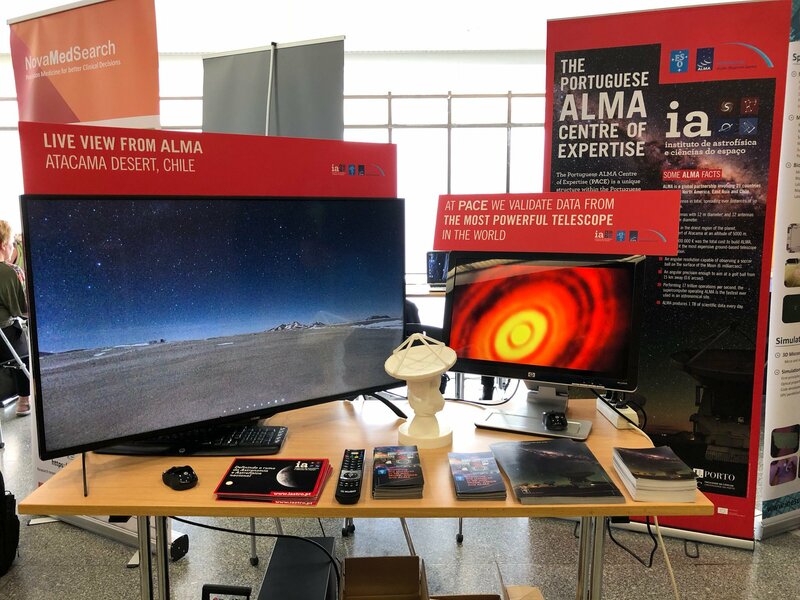 PACE had its own stand introducing ALMA to the visitors. 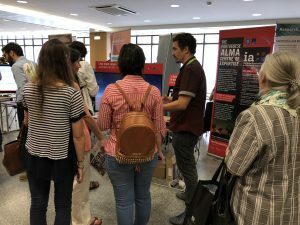 The photos show the stand and the analyst Israel Matute confronted to curious researchers and students. 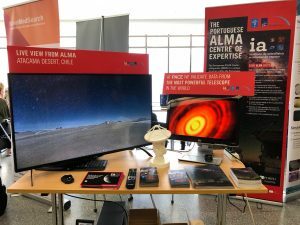 The PACE, on behalf of the Joint ALMA Observatory, is pleased to announce the ALMA Cycle 6 Call for Proposals for scientific observations is now open. ALMA Cycle 6 is currently scheduled from October 2018 to September 2019. Investigators of any professional background, nationality or affiliation are invited to submit proposals before the deadline of 15:00 UT on Thursday 19 April 2018. The portuguese national science foundation, Fundação para a Ciência e Tecnologia (FCT) has opened a call for PhD fellowships, from 28th of February to 28th of March 2018. The positions are for up to 4 years (tuition fees are covered). The selection is done by FCT. The Instituto de Astrofísica e Ciências do Espaço (IA) welcomes pre-applications until March 16th. Selected candidates will be supported by IA. The Instituto de Astrofísica e Ciências do Espaço (IA) is the most prominent research unit in the field of Astrophysics in Portugal, integrating researchers form the Universidade of Porto and the University of Lisbon, and is responsible for a major fraction of the national productivity in international ISI journals in this area. 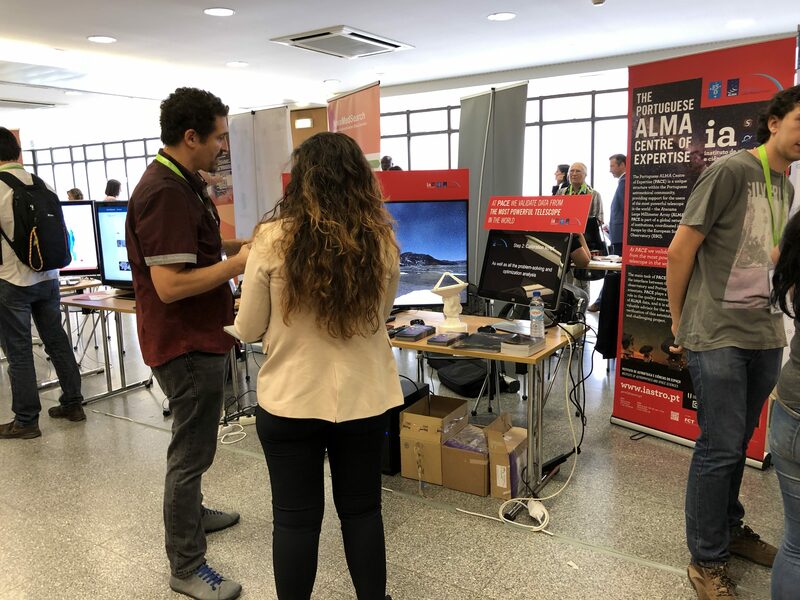 The research and development effort at the IA includes most of the topics at the forefront of research in Astrophysics and Space Sciences, complemented by work on instrumentation and systems with potential use in Astronomy and Astrophysics. We are currently looking for strong candidates to support in this call, in particular for research with ALMA. If you know of promising students, please let us know! The portuguese national science foundation, Fundação para a Ciência e Tecnologia (FCT) has issued a call for research contracts, in the context of the Stimulus to Scientific Employment which will be open from 19th January until the 16th February 2018, 17:00 (Portuguese time). The positions are for up to 6 years. The gross monthly income corresponds to the salary of a Junior Researcher (level 33 – 2.128,34€), Assistant Researcher (index 195 – 3.191,82€), Principal Researcher (index 220 – 3.601,03€) or Coordinating Researcher (index 285 – 4.664,97€), depending on the profile of the candidate. The selection is done by FCT. Each candidate will have to select and have the support from a host institution in Portugal. The Institute of Astrophysics and Space Sciences (IA) welcomes pre-applications to the FCT – Stimulus to Individual Scientific Employment 2017 call. IA is the reference institution for this area in Portugal, integrating researchers from the University of Porto and the University of Lisbon, and is responsible for a major fraction of the national productivity in international ISI journals in this area. The research and development effort at the IA includes most of the topics at the forefront of research in Astrophysics and Space Sciences, complemented by work on instrumentation and systems with potential use in Astronomy and Astrophysics. IA is also the host of the Portuguese ALMA Centre of Expertise. PACE is currently looking for strong candidates to support in this call. If you are interested or know of someone who is, please let PACE knows!